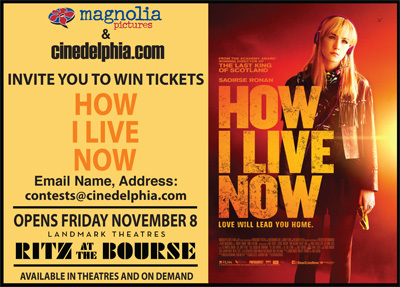 We’re giving away tickets to see How I Live Now at the Ritz Bourse. To enter, e-mail us at contests@cinedelphia.com, and tell us why you want to go! Winners will be chosen at random, only one entry per household please! I would love to attend because there is really nothing I love more than movies. It is my escape from the world and all the issues in it. It’s my vacation, my transporter to another time and place. I call it my eyes wide open REM stage of life.